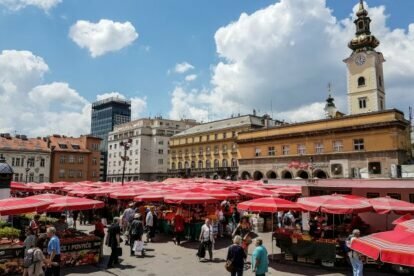 Zagreb has many farmer’s markets and a long tradition of fresh and local products. Dolac is the oldest and most famous farmer’s market in the very heart of the city. Every day, early in the morning, Dolac comes alive. There’s an explosion of every known color and you can smell all that fresh fruit, vegetables or homemade cheese traditionally sold by kumica. Kumica means little godmother but its colloquial meaning in Zagreb is a woman from a rural area selling her products in a farmer’s market. Those hardworking women have supplied the kitchens of Zagreb for centuries and that is why on Dolac there is a statue of Kumica as a mark of remembrance of how much they mean to the residents of this city. Dolac is just a few steps up from Trg bana Jelačića, the main square where the market used to be until the early 20th century. To grab the best products, I get up early on Saturdays and first look for high-quality fresh fish from the Adriatic sea. I also make sure to get some fresh cottage cheese from my favorite kumica. Here I buy my supplies of honey and some other homemade goodies for which you have to go under Dolac, where the closed part of the market is. After some good shopping, I never miss eating in Burek. From there, it’s only few minutes walk to the best Worst coffee in town. And that is what I call a perfect Saturday morning in Zagreb.